UMBC has not only helped me achieve my goals, it has helped me become the person that I am today… The past four years at UMBC have been the best four years of my life. Matthew Kelly’s passion for German language and culture has shaped his UMBC experience and the next steps in his academic career. As a standout student in modern languages, linguistics, and intercultural communication, Kelly has received numerous awards, including the Plogman Language Award and his department’s Palomares Award for Excellence in Service and Academic Achievement. Kelly has been very involved with the UMBC ice hockey team, as a player, team vice president, and a recruiter, and enjoys connecting his love of hockey with his interest in German. He was a student teacher and assistant ice hockey coach at Mt. Hebron High School in Howard County, and led a group of Mt. Hebron German language students on a campus visit of UMBC. He also served as a German tour guide for area high schools at the German Christmas Market in Baltimore’s Inner Harbor. Kelly is a recipient of the 2016 J. William Fulbright Grant and will teach English in Bavaria, Germany, following graduation. 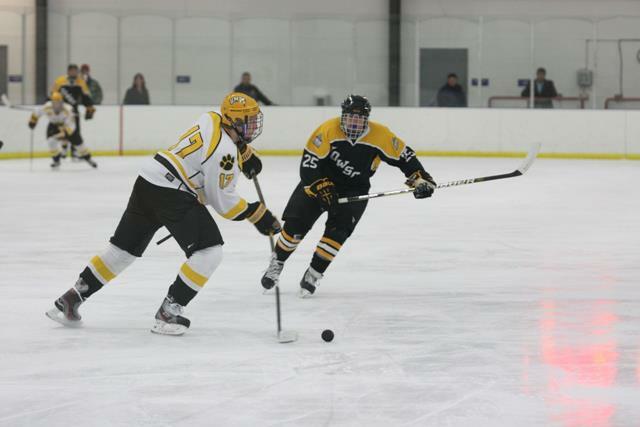 Images: Matthew Kelly completes a pass in a UMBC ice hockey team game; photo courtesy of Matthew Kelly. Portrait by Marlayna Demond ‘11 for UMBC.